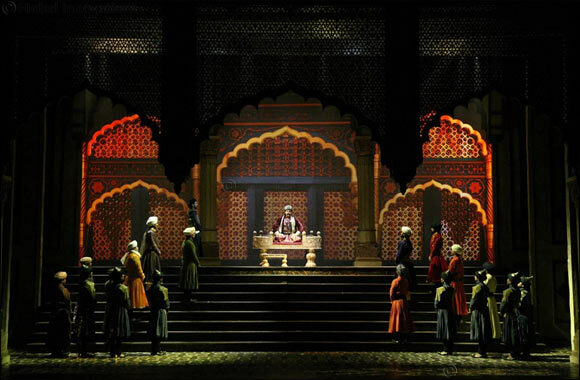 Dubai, UAE, January 06, 2019: “Mughal-e-Azam: The Musical”, the first Broadway-style Indian musical extravaganza to be premiered at Dubai Opera from January 10 to 12, 2019, has explored the abundance of Arabic calligraphy aimed at reviving the richness of Indo-Arabic cultural exchange. Arabic calligraphy, Turkish architecture and Hindustani classical music are amongst the varied elements that come out as a fusion in this musical play. The Musical, directed by noted Indian playwright Feroz Abbas Khan and produced by Shapoorji Pallonji Group, is a spectacular production retelling a beautiful Bollywood love story. The classic movie of the same title by K. Asif with its dialogues, music and songs are part of the cultural memories of many generations. The essence of the evergreen movie has been captured in the musical through larger-than-life-set designs, intricate costumes and elaborate choreography. The stage production has all the dramatic elements one wants from a musical — thunderous dialogues, melodious songs and mesmerizing dance sequences. It brings the richness of the Mughal era to movie and theater lovers. From costumes to language and from music to architecture, everything in this 16th century story depicts the artistic and cultural richness arrived as a result of Indo-Arab cultural convergence. The 16th century India saw the confluence of cultures from the Arab world, Turkey, Mangolia, Iran with the local Indian culture. Touted as the biggest theatrical production from India, the musical involving live singing with dance sequences brings back the Mughal era for today's generation to witness its grandeur. The play has swept the Broadway World Awards, bagging awards in seven categories including Best Play and Best Director.